You know that song that kinda goes "Shake your Bootie, Shake your Bootie, Shake Shake Shake"
Replace the words with "Check Your Boobies, Check Your Boobies, Check Check Check"
Have you got that song in your head now? Good. My work is almost done here. I have decided that on the 1st of every month I will share a pic on my blog, Pinterest, Instagram and Twitter to remind anyone ladyfolk that happen to see it to #CheckYourBoobies. It's a simple message and something we all KNOW we should do, but day to day life often causes us to forget. We shouldn't forget though, because checking could save your life. So I am asking for your help. Every month on the 1st day of every month share a picture on your own social media to remind your friends and family to check their boobies. Have fun creating your own image, or share someone elses. 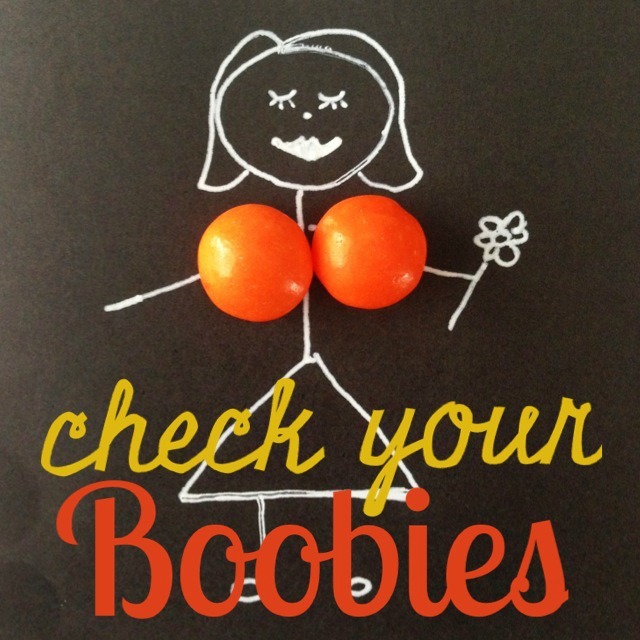 Tag it with #CheckYourBoobies and just share the beejeezus out of it and help us remind our sisters that checking your breasts on a regular basis is crucial for the early detection of breast cancer. Are you in or are you in? Have you checked your Boobies this month?